ConvertKit has stolen my email-lovin' heart for all of it's many features. Because there are so any features and bells and whistles, it's hard to know how to do ALL THE THINGS so you really get the most bang for your buck. ConvertKit is a powerful email marketing platform for bloggers, and it's hard to know how to use all the features. These 3 simple tricks have made my email workflow much more streamlined, and allow me to use the ConvertKit platform more effectively. I made the switch from MailChimp to ConvertKit last year, after a very stress-induced decision making process, and quickly realized it was the best decision for my business. I was able to get rid of LeadPages, segment my list in ways I never thought possible, and efficiently run all areas of my business through one master list. I am constantly recommending ConvertKit for bloggers who are looking to go from basic emails to emails that help them meet their goals, like really specific list segmentation to target readers, and creating awesome sales funnels to increase revenue, but only sending sales emails to people who really want to see them. One of the problems I started to have, however, was constantly feeling the need to create custom pages for every new opt-in form or opt-out link trigger. I mean, when a subscriber clicks a link, they have to go somewhere, and sometimes sending them to my home page didn't make sense. I figured out a really simple solution in the form of two different pages on my blog. Every form or landing page that you create has a settings tab. In this settings tab, you have the option of redirecting new subscribers to a page immediately after the enter their name & email address. Problem #1 - Unconfirmed subscribers received the free opt-in offer. Initially, I was putting the URL of my opt-in offer in this field. However, because I prefer to keep the 2-step verification system in place, my freebie was landing in the hands of unconfirmed subscribers. They would sign up, get their free thing, then never confirm their email address...which meant I wasn't growing my list. Problem #2 - The generic ConvertKit success page is boring. Instead of redirecting people, you can type in a success message, but it's still pretty boring for my taste. I would rather my actual confirmed subscribers see my fancy schmancy opt-in page, so for the first redirect, I created a general opt-in page on my blog that ever new subscriber sees. There's even a funny gif from Stepbrothers. Click HERE to see it in action. Not only am I saving myself a ton of time creating big ol' landing pages for everything, but my new subscribers get a warm welcome, they get instructions telling them to check their email to confirm, and they get a taste of my sense of humor. Win-win! Ok, link triggers are pretty much my favorite feature of ConvertKit. I love that I can set up a link trigger and have my subscribers opt out of specific emails, rather than unsubscribing from my entire list. Let's say you're promoting a course. Typically, when you are promoting a course, you plan to send several emails to your subscribers giving them plenty of information about the course in hopes that they will purchase from you. Problem: You piss people off so they completely unsubscribe from your list. Not everyone on your list will be interested in whatever it is you're promoting. To fine tune your promotions, give your subscribers the option to opt out of those promotional emails but remain on your overall list. Link triggers allow you to do that very easily. I wanted my subscribers to know, beyond a shadow of a doubt, that they had successfully opted out of specific emails, rather than being redirected to my home page or some other page and wonder if it worked. And of course, my sense of humor is in full effect here, too, this time with my boy Kip from Napoleon Dynamite. For my last trick, I'm going to saw a woman in half! Just kidding. I couldn't find a volunteer for that. This is particularly troublesome when you are linking to your landing page from someone else's website, or if someone else tries to share it. At first glance, a potential subscriber may not know whose list they are signing up for because the URL is all crazy. Can you speak that URL out loud? Heck, can you type it easily? Nope. If you are promoting this page, for example, during a Facebook Live broadcast or in an Instagram story, you should be able to speak the URL clearly, or type it without having to go find the link every time. It's branded & it's easy to remember, making it more easily shareable! Create a new page & give it a simple name, like "Join List" or "Subscribe"
Select the landing page of your choice from the list, then save. Voila! You will now have a ConvertKit landing page with your custom URL! Hooray! So there you have it! Three simple tricks to make ConvertKit even awesome-er. 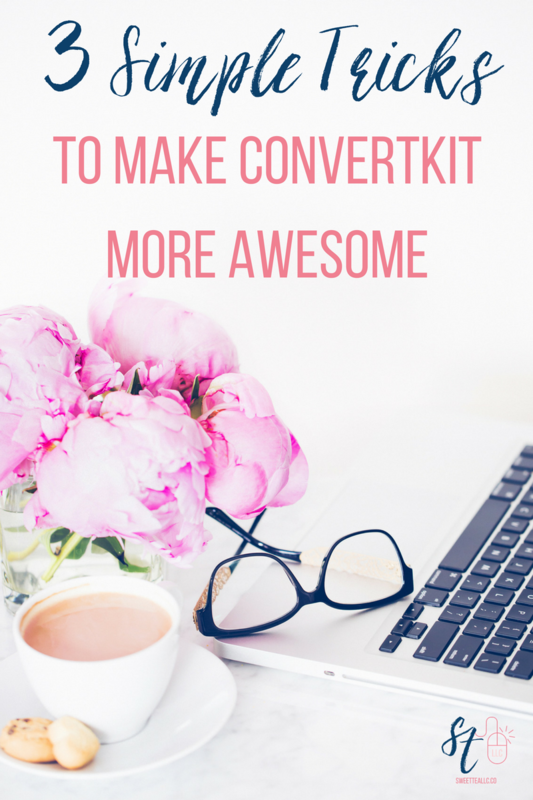 Want to learn more about ConvertKit for bloggers? I've got you covered! Do you have specific questions about how to use ConvertKit? Leave a comment below and I'll put together more helpful blog post tutorials!